The National Trust of Australia (NSW) President, Mr. Brian Powyer, and our Board of Directors request the pleasure of your company at the 2019 National Trust Heritage Awards. Celebrate the 25th anniversary of the National Trust Heritage Awards at our luncheon ceremony – a signature event of the Australian Heritage Festival. Reflect with us as we showcase a quarter century of outstanding innovations, conservation, advancement and stories of heritage in the built, cultural and natural environment. Our Master of Ceremonies will be ABC Radio Presenter, Simon Marnie and our Keynote Speaker for the National Trust Awards is Architect, Urban Designer, Councillor and UNSW Professor, Philip Thalis – co-author of #PublicSydney. Join us on Friday 10 May 2019 from 11.30am to 2.30pm at Doltone House, Jones Bay Wharf, 26-32 Pirrama Road, Pyrmont Point NSW. 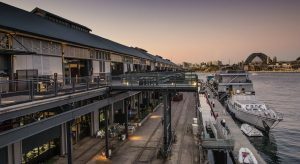 Jones Bay Wharf, 26-32 Pirrama Road, Pyrmont Point NSW.